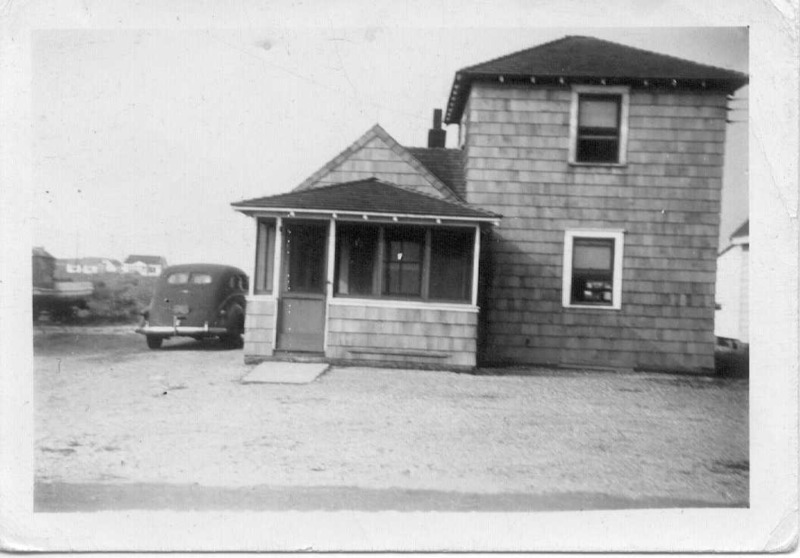 The fascinating pictures below of the house and it's evolution were graciously provided by our Jacqueline Avenue neighbors, Ray Stone and his sister Nancy Michaels. 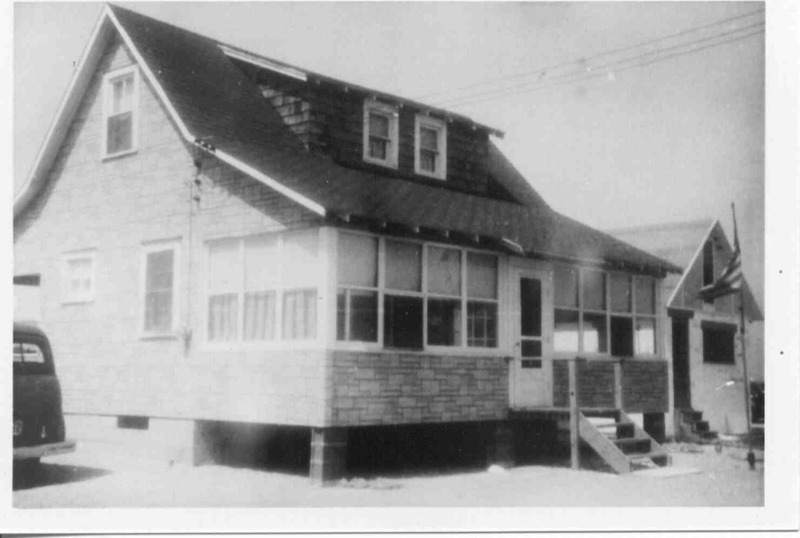 Their grandfather Russell Hann erected the house following the 1944 hurricane which had destroyed his previous home at the same location on Jacqueline . 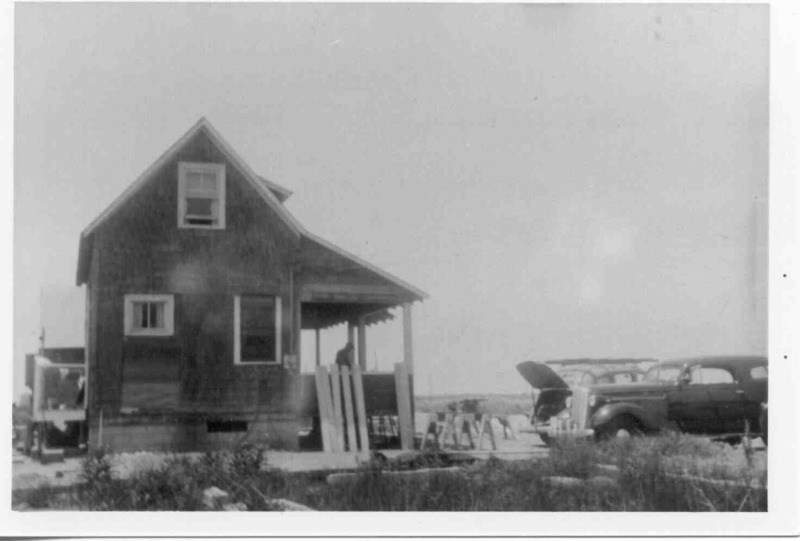 As told by Ray, this house was found resting on the sand somewhere down near the bay after the 1944 hurricane. His grandfather purchased the shell for $25, moved it to his recently cleared lot and sat it on a foundation. 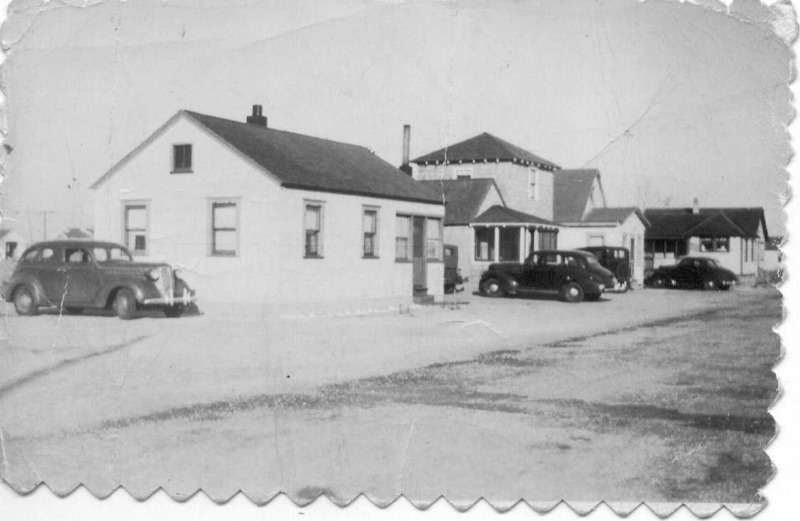 The car in the drive, curtained windows and electric hookup would indicate it was restored and occupied. Bonds Coast Guard station can be seen in the distance. 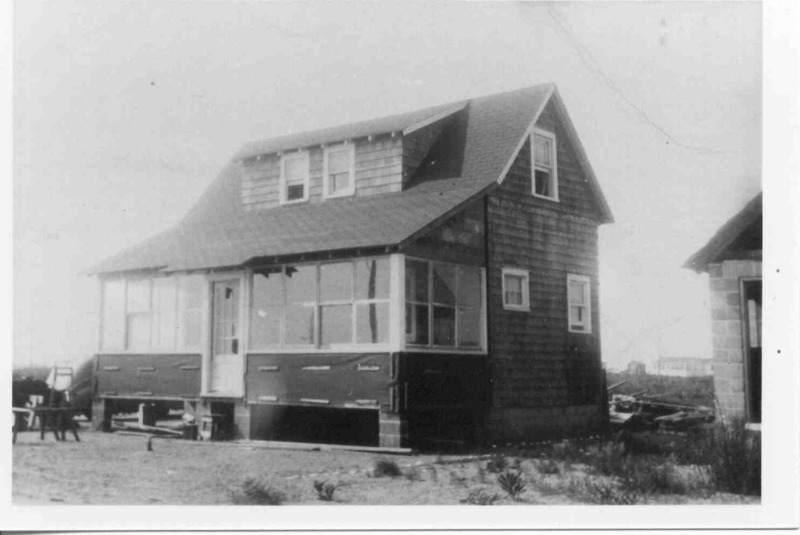 First located near the ocean front, it was damaged then rebuilt and moved to the bayside in 1908. Below Mr Hann can be seen working on the porch addition to the revised new front of his house. They are hard at it with car trunks open, saw horses sit in the yard and some planks leaning up against the side waiting. The new front entryway replaced the main door on the east side, and is now closed in with a small window. 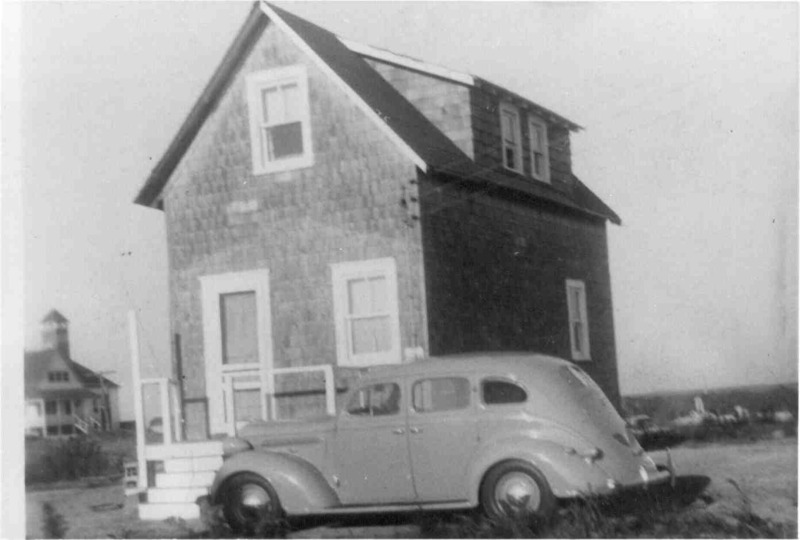 A single story house is now built next door, another roof may also be visible beyond, but otherwise the bay end of Jacqueline appears mostly empty. Supported on four concrete piers, the new enclosed porch appears nearly complete except for front steps. The roof extension blends into the old at somewhat less of an angle, the dormer is unchanged. Tar paper surrounds the front in wait for exterior siding which will eventually cover it and the original cedar shakes. The Beach Haven Inlet water tower can just be seen at the upper left. The block house next door appears complete though still in need of windows and front door. This view of the house taken from the opposite angle, shows the open space behind the house that stretched over to the trailer park in the distance. Many years later that empty space would eventually contain Joan and Janet Avenues which were developed in the 1970's. The picture below, of the screened in porch and front steps leading to the street, recall my earliest memories of the house. However, that was all destined to change in March of 1962 when it would be pummeled by the great nor'easter and nearly float away. 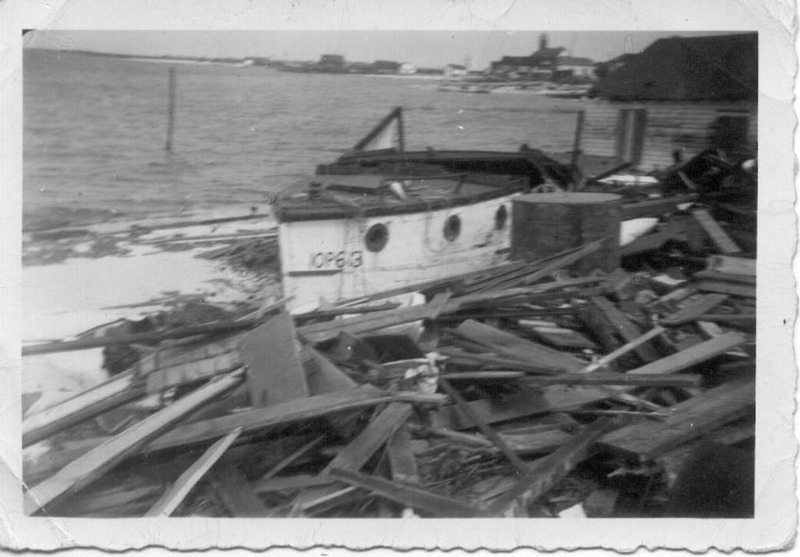 Fortunately it bumped into the house next door and remained there until the end of the storm; then hauled back into position where she sits to this day. Now surrounded by many contemporary homes the beach house grows older as the ocean waves continue to pound the shoreline a few hundred feet away. 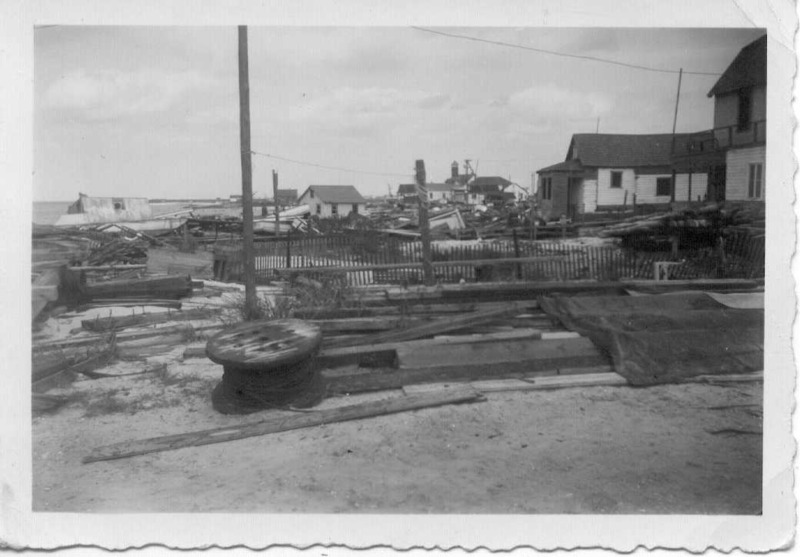 While the house may be a little worse for wear and tear these days, the pictures above testify to the fact it was likely one of the first to be rebuilt on Jacqueline Avenue after the terrible destruction of the 1944 hurricane and also suggest that the central portion is a humble yet hearty survivor of that legendary storm. 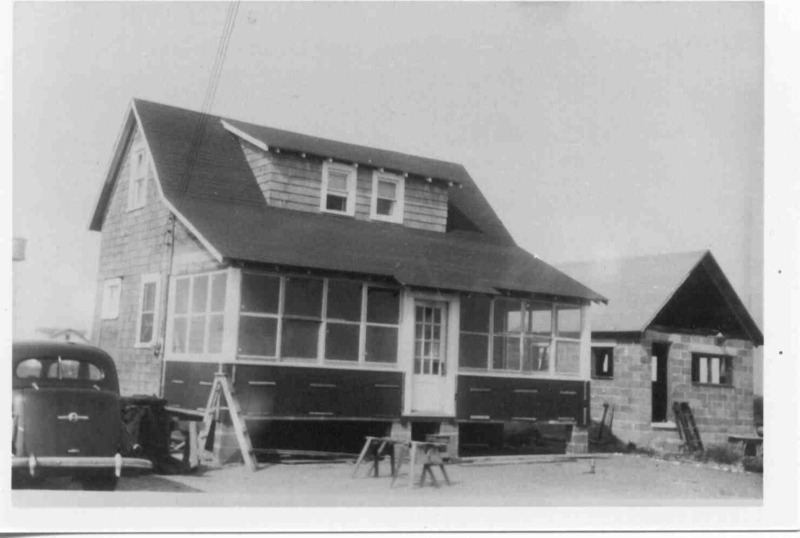 Since 1987 the Long Beach Island Historical Preservation Committee has awarded more then 400 plaques to owners of historic structures on Long Beach Island. On Sept 19, 2003 during a ceremony at the Barnegat Light Historical Museum, 19 plaques were presented including one for our house in Holgate. 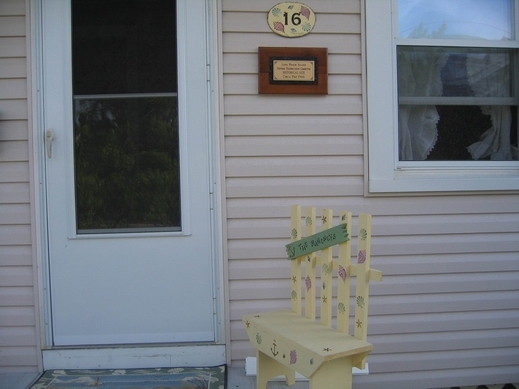 The following spring our plaque was proudly mounted as the house was being readied for another summer of fun at the shore. 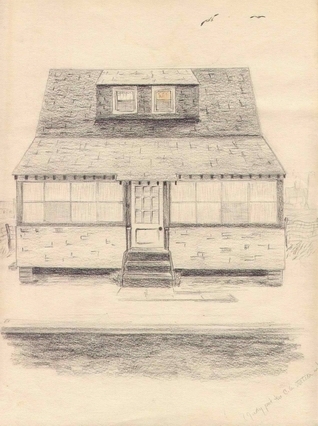 Many years ago, a teenaged cousin made a sketch of the house during her family's visit to Holgate. This work is a treasure from those earlier times and displayed to remind all of this great memory-filled house by the sea. 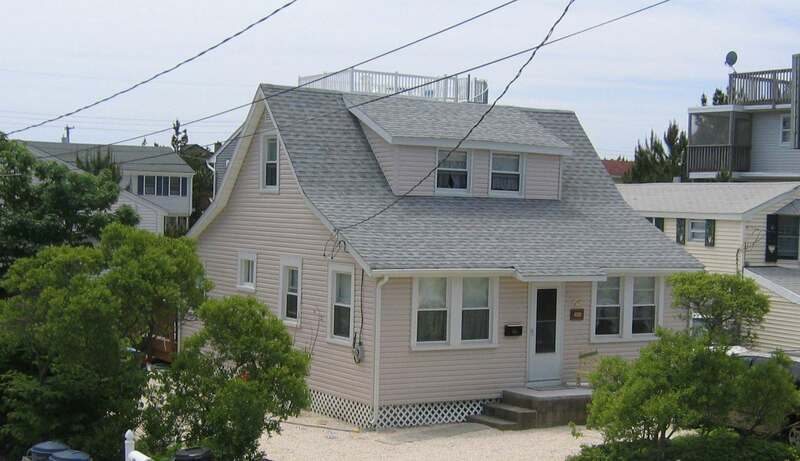 our old beach house stands proud and continues to provide us with a delightful place for summer respite. Thanks Mister Hann!